Toronto, ON - March 15, 2010 - All eyes will be on Toronto this summer. 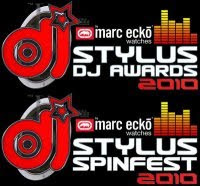 Top DJ talents and industry insiders from across the country will unite in celebration of the 5th Annual Stylus DJ Awards & Spinfest presented by Marc Ecko Watches. From May 28 to May 31, 2010, Canada's most influential players in club music and lifestyle will be throwing it down at Canada's finest venues including the Queen Elizabeth Theatre at 190 Princes Blvd, CNE Grounds, where the 2010 DJ Stylus DJ Awards will take place on Monday May 31st at 8PM. The annual awards show will draw a crowd of over 1,200 guests -- an event that has sold out since its inception. The 2010 Stylus Spinfest will begin Friday, May 28th and continues through to Sunday, May 30th, bringing you much-anticipated events such as the Official Stylus Launch party, the second edition of the "Who's Got Next?" compilation series, and the National Stylus DJ Conference Tour: It Starts with the DJ 3.0. Returning for its third year, It Starts with the DJ 3.0 will hit three of Canada's metropolitans: Vancouver, Montreal and Toronto. Joined by a roster of internationally renowned recording artists, producers, record label executives, and celebrity DJs, Spinfest and The Stylus Awards Show presented by Marc Ecko Watches for its second year, will unite a diverse and artistic community whom all share a common interest: to grow Canadian urban music and talents both nationally and abroad. The annual event continues to increase public awareness of Canada's dynamic music scene and spotlights the significant contributions that DJs have made to pop culture today. "We are extremely thrilled to present and celebrate our fifth year anniversary. Over the past four years the continued support from the music community and our many sponsors has been overwhelming and propels our mission to build the industry and celebrate the talented Canadian DJs, and recording artists through this event." "This is an exciting year for us and special moment in Canadian history to bring the finest DJs, artists, and industries together to celebrate the music culture & lifestyle we love so much! We take great pride in putting the spotlight on Canadian Artists and some of the best DJ's in the world." "We're proud to be a part of Stylus Spinfest Weekend for the third year in a row. Those honored over the course of this weekend are the individuals that help drive popular culture in this country and abroad. Aligning with the Stylus Group is an opportunity for us to remain committed to a culture and a lifestyle that helped build our solid foundation." Voting period begins: March 22nd 2010 at 12-noon EST through March 29th, 2010 at midnight. Log on and visit http://www.stylusdjawards.com/ to vote for your favourite Canadian DJs and Artists. For all nominee voting guidelines, please refer to the Stylus website for rules and regulations. With over twenty categories represented, the Stylus Group is proud to continue recognizing DJs from across the country and in every genre by presenting 3 new categories including; Fan Choice Artist of the Year, House DJ of the Year and Club Dance DJ of the Year. Tickets are available for purchase in April 2010 via http://www.ticketbreak.com/ for $30 plus service charges. The Stylus Group would like to thank its 2010 Sponsors; Marc Ecko Watches, Athletes World, Fila and Pioneer DJ for partnering up to bring the people four days of celebration plus the very best in Canadian DJ culture. For more info on Marc Ecko Watches or to request an interview with Jesse Jones, contact Julia Che at julia@lotusleaf.ca/ 416 928 1978.